Here at Little House in the Cove I consider it a blessing to share with you thing things that God lays on my heart. 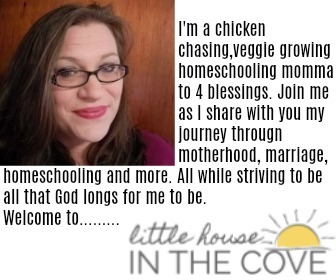 I love sharing our homeschooling discoveries, my motherhood seasonal changes, our marital journey and so much more. As you can imagine maintaining a website costs money, therefore there are some ways that I am able to continue to keep this site moving smoothly. I often use affiliate links – or refer to products by sending followers to my blog – on my social media sites: Facebook, Twitter, Pinterest, and Instagram, to products that I recommend and those links, help generate an income for my family. I also offer a Google search field in my sidebar that enables you – my reader – to shop through me. This is at no extra cost to you, but it does help grant my family a second income and enables me to continue being a stay-at-home mom. I make every effort possible to ensure that all advertising is in agreement with my personal values and that all items I recommend are quality items that I stand behind. However, sometimes an ad slips through the cracks. I hope you’ll grant me grace in those instances. I also offer free printables to my readers and subscribers. I ask that you be respectful and use them for your personal use only. If you share about our materials, I ask that you link back to Little House in the Cove and give proper credit. All images used on Little House in the Cove are legal. Many of them are my own personal property. You may not use images from this site without the written consent of the owner. All of the content at Little House in the Cove is my own personal content unless otherwise noted. If you refer to the content of this blog, please link back to Little House in the Cove. You may not copy a post in its entirety without the written consent of the author. This blog is a personal blog written and edited by me. For questions about this blog, please contact Bridget Childress.